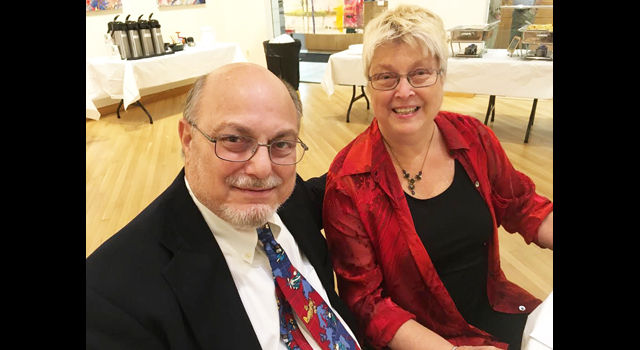 More than 50 members of Kehilat Chaverim honored long-time member Sheila Mascolo at a catered supper and Shabbat service on Friday, May 11 at the Mandell JCC in West Hartford. Mascolo, who lives in West Hartford, was feted for her top notch culinary and organizational skills – which the congregation has reaped the benefit of for so many years. Kehilat Chaverim, which is celebrating its 40th anniversary later this year, has held High Holiday services at the Mandell JCC for most of its history – and for each Rosh Hashanah and Yom Kippur break-fast, Mascolo has developed the menu, ordered and prepared much of the food (including her to-die-for deviled eggs). Although Mascolo assures her fellow congregants that she is not planning to give up the reins entirely (after all, there are still special events and meetings at which members must be fed! ), she does plan to retire from the High Holiday food preparation. “It is likely we will need a committee of eight people to handle what Sheila has done single-handedly,” says Sue Garten, co-chair of the High Holidays Committee. Marcie Schwartz, Garten’s co-chair, agrees. Did we mention the deviled eggs? CAP: Sheila Mascolo and her husband Dan at the Kehilat Chaverim dinner.